​Call us at 612-558-1737 with questions or to schedule. Looking for Commercial Dryer Vent Cleaning? Visit our Commercial Dryer Vent Cleaning page. 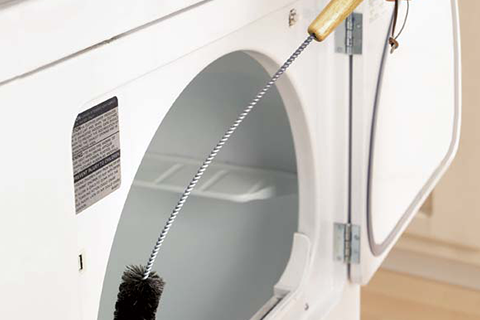 For further reading, visit our blog post: 5 Reasons to Have a Dryer Vent Cleaning Yearly. An added benefit of dryer vent cleaning is that it often leads to the discovery of disconnects--points in the system where the ducts have become separated from, leaving the lint and steam to exhaust in areas that were not designed to handle it. The result is reduced energy efficiency because of diminished air flow, and more importantly, moisture damage and a potential fire hazard. There are many ways residential clothes dryers are vented, which plays a role in the method of cleaning utilized. Sometimes the dryer venting is only a few feet long and a straight shot from the unit to the outside vent, resulting in a relatively simple job. But some systems can be very long and have several twists and turns, making the cleaning process more labor-intensive. A dryer line that vents above the first floor or onto the roof elevates the level of risk and difficulty and will therefore be assessed an additional cost of $50. The material used for venting dryers varies as well. Some vent lines are made of galvanized pipes (preferred), while others consist of flexible aluminum or coiled plastic venting. Depending on the circumstances, we use brushes, air wands, and air snakes to clean the vent line. In most cases, the tool of choice is a reverse-blowing skipper ball for its ease of use and extreme effectiveness. The tool is fed through the dryer vent line, attached to an air hose, until it reaches the back of the dryer. Once engaged, the skipper ball spins around at a high velocity and blasts air out of tiny holes on its surface. The blast of air pushes lint out ahead of it as the tool is withdrawn, and the lint is expelled with it. The process is repeated until no more lint remains and the technician establishes good air flow. Various DIY methods of dryer vent cleaning and tutorials abound, and a sufficiently motivated and informed homeowner can often carry this out successfully. Doing so with a leaf blower, however, is strongly discouraged. Unless your vent line is extremely short, with no twists or turns and easily accessible from the outside, among other criteria, these methods could end up compounding the problem and creating a fire hazard. The process of cleaning a dryer vent from the rooftop is more challenging because of the inherent risk involved. Any difficulties that arise are amplified when you're two to three stories up. Our technicians specialize in difficult rooftop jobs and use care and precision to ensure all of the lint is removed from your dryer vent line. Our air hoses are sufficient in length to accommodate multiple stories. The spinning, reverse-blowing skipper ball used to blast lint out from within the vent line reaches all the way from the exhaust vent on the roof down to the back of the machine itself. While they're up there, our technicians will also ensure there's no screening over your vent cover, a stunningly common oversight in rooftop dryer vents, creating the potential for dangerous blockages. Yearly visits can be scheduled to help you stay on top of this important task. Minnesota winters and the freeze/thaw cycle tend to harden the lint around rooftop vent hoods, making it more stubborn and difficult to remove the longer it stays in place. We can reach out with a reminder a week or so before the service is due to schedule a date & time that work for you. In cases where your dryer vent is difficult to access because of an extremely high roof, a dangerous pitch, slippery surface, etc, a higher price may be bid on-site at the discretion of the technician. No work will be performed without customer's consent.